The first movement of the 1st Sonata is a strange affair. It’s full of mysterious, whispered comments, punctuated by chords from the piano as the cello rushes all over the place, muttering. The scherzo which follows is violent and unrelenting, but in the end the music just seems to fall apart and then simply stops. The last movement, despite being marked con moto is a pretty violent piece which seems concerned with protest. This is the first chamber work by Meyer I’ve heard that comes close to the difficult music, and processes, he employs in his orchestral music. It’s as fine a piece as anything I’ve heard from him. Despite being called Canzona the middle piece on this disk is far from a singing piece. It has all the hallmarks of a violent discussion. It’s percussive and very disturbing, not what you’d expect at all. This is the very essence of Meyer - he never does what you might expect of him. Thus this small(ish) piece which might be expected to be light and lyrical turns out to be strong and closely argued. The 2nd Sonata is more classical - insofar as it has four movements - but there’s just as much event as in the other works on this disk. Particularly impressive is the whispering scherzo, marked delicato, which follows a first movement of high energy and terse argument. A very short slow movement leads into the finale marked Feroce, which, in many parts, is far from it. Indeed, there is much lyrical music in this movement, the most lyrical music on the disk! These three pieces are all strong and well worked out and will give much satisfaction, especially if you like your music to make you think about what is going on. The performances are excellent, and all the performers go all out to make this music really speak to us. The notes in the booklet are excellent and the recording is superb. 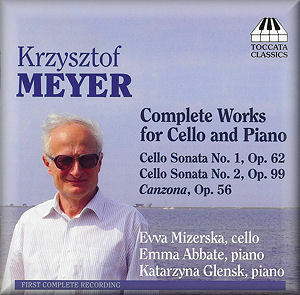 I’ve said it before, but I shall repeat myself: Meyer is a major composer and he cannot be ignored. There are now sufficient CDs of his music available for us to be able to really discover him and his work. For me this is essential listening, and I would urge everyone who is interested in contemporary music to join me in discovering one of the most elemental and exciting composers currently at work today.